 This plodding tale of Maslow's adventure to Russia's Turkmenistan in search of an exotic horse is salvaged only by the historical filler. What began as an itch to ride a fine Turkmen horse turns into a two-year struggle to secure an official invitation to visit a remote corner of the Soviet Union. After learning the Russian language, taking riding lessons, and desperately searching for contacts, Maslow finally lands a position on a visiting delegation representing New Mexico. Maslow provides an intriguing peep into the lives of male Turkmens, though by his account they spend most of their time eating and drinking vodka. Except for a few stereotypical references to the slavelike life of Turkmen women toiling for hours in the boiling kitchen, Maslow fails to provide any sense of women other than their duty to serve their men. Once, finding a strange woman curled up beside him, Maslow is inspired to write an essay on ``why men don't ride horses anymore,'' concluding that every civilization has ``to deal with the question of how to keep men's pants zipped.'' Such tangential gender stereotyping detracts from an exploration of the rich culture. His sometimes elitist attitude toward Turkmen officials and country people also seems out of place. Somehow he makes friends who invite him to return. On this second trip he manages a short ride on an Akhal- Teke purebred steed. But Maslow's dream of riding across the desert never materializes. He concedes that he is probably not a good enough rider to handle such a magnificent beast for the duration of the journey and credits Central Asia for teaching him to recognize and accept his personal limits, ``a hard lesson for a male.'' 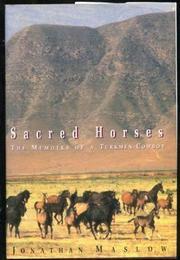 Interesting history of Turkmenistan and horses, but an awfully long and condescending account of a man's failed dream.